1. Preheat the oven at a temperature of 210°C. 2. Throw in a pinch of salt in a saucepan and then boil the potatoes in it for around 15 minutes. 3. Drain them and place them in a bowl. 4. In another saucepan insert some olive oil, peas, the celery, carrots and onion. Stir for 5 minutes. 5. Include the lamb mince or ground beef, and stir for another 5 minutes until there are no more lumps and it also changes colour. Add the ale and mix well with meat. 6. Add the flour, broth, salt and pepper and heat for around 25 minutes at a low temperature. 8. In another pan soften the butter. In the meantime mash the potatoes well. 9. In the pan place the potatoes, milk, salt and pepper. 10. 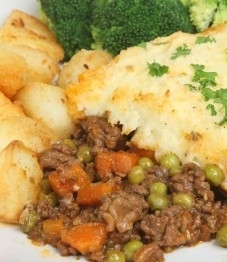 Place the beef mixture in a baking dish and then put the potato mixture on top. 11. Sprinkle the cheddar cheese and parsley on top. 12. Bake for 25 minutes and then it is ready to be served. This entry was posted in Beef, By Occasion, Lamb, Recipes, Sunday Lunch, Vegetables and tagged beef, food, lamb, pie, Recipes, traditional maltese recipes. Bookmark the permalink. Thanks for delicious recipe. One question please, since I live in Sydney Australia I cannot get (unfortunately) hop leaf beer. What other beer can go well with recipe? we have plenty of lager beer available but this might not go well. Thanks for reply. Keep it up, what a wonderful idea.